Hudson’s Bay was originally set up in 1670 by English royal charter and headed by a German cousin of the reigning Charles II. Lately it has existed as a Canadian company with a North American presence. Now, though, Hudson’s Bay has wangled a way back to its Teutonic roots with a $3 billion deal to buy Cologne-based retailer Galeria Kaufhof. The enterprise value of the transaction, Hudson’s Bay said on Monday, is equivalent to 8.6 times Kaufhof’s EBITDA last year. The Canadian group trades on an equivalent multiple of about 12 times, Thomson Reuters data shows. That helps the financial consequences of the deal look benign for Hudson’s Bay. The company has also agreed to sell 40 or more Kaufhof stores to a joint venture it operates with Simon Property. Assuming the JV can raise the funds it needs to buy them and other conditions are satisfied, this second deal will largely finance the Kaufhof purchase for Hudson’s Bay. It’s a neat two-step that pleased investors sufficiently to add 8 percent to Hudson Bay’s market capitalisation, raising it to around $4.7 billion. Metro, Kaufhof’s current owner, has come off second-best to the venerable fur trader-turned-retailer, at least if a 5 percent drop in its stock price is anything to go by. Sure, the disposal is at a premium to its own EV-to-EBITDA multiple, and it allows Metro to focus its resources on its supermarket, cash-and-carry and electrical retailing businesses. A sale to a rival like the owner of Karstadt, Germany’s second-largest department store could, however, have been worth more because of the potential for cost cuts. Metro instead opted for certainty, avoiding a tough discussion with German trade unions and perhaps competition concerns. Also, a local deal might not have come with the same real estate-related sweetener. Hudson’s Bay anticipates higher operating cashflow and a reduction in its debt-to-EBITDA ratio as a result of the Kaufhof purchase and subsequent real estate sale. While it expanded into high-end U.S. department stores with the purchase of Saks two years ago, it’s a while since the company had to serve customers in the Old World. The financial cushion may prove useful against the risks involved in rediscovering Europe. 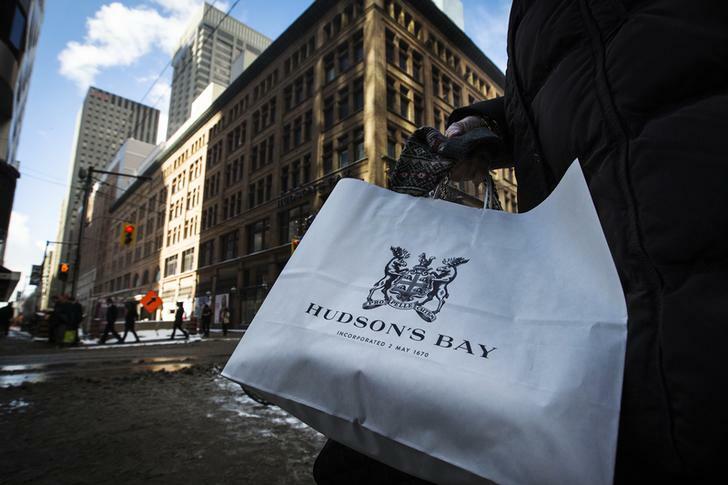 A woman holds a Hudson's Bay shopping bag in front of the Hudson's Bay Company (HBC) flagship department store in Toronto January 27, 2014. Hudson’s Bay said on June 15 that it will acquire Galeria Holding, parent of German department store chain Kaufhof, from current owner Metro for an enterprise value of 2.4 billion euros. The Canadian group, which acquired U.S. store chain Saks for $2.9 billion in 2013, also said that it has entered into an agreement in principle with Simon Property pursuant to which the previously announced U.S. real estate joint venture between Hudson’s Bay and Simon intends to purchase at least 40 of Kaufhof’s owned or partially owned properties for at least 2.4 billion euros, subject to documentation, financing and certain other conditions. As a result, the company said, its acquisition of Kaufhof is expected to be largely financed by proceeds received from the real estate transaction and it does not intend to issue equity and expects to incur limited additional debt.